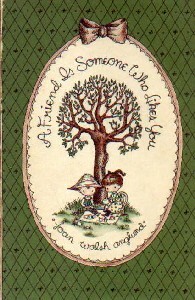 (1926-) Joan Walsh Anglund became successful with her first book, A Friend Is Someone Who Likes You, in 1958. She's been making books featuring these same round-faced, mouthless characters ever since, and her popularity continues to grow. There's something ineffably sweet about her creations, which are based in large part on people and places in her own life-- particularly on her children Joy and Todd. JWA is a perennial favorite here and a popular choice for gift books. She seems to strike a nerve, and her images of childhood have an innocence and purity that people respond to with a rush of nostalgia. Older copies of her books are usually preferred by those who want their nostalgia to be real, right down to the feel of the book, and the out-of-print Brave Cowboy is perhaps the most sought-after title here. We usually have several used books in the Friend series (if you can call them a series), and of course we can order new copies anything still in print. We also have several framed prints and a doll of hers available for sale. Please inquire. Newsflash! The Brave Cowboy is at last back in print! *Baby Dear. Andrews McMeel, 2005. *The Brave Cowboy. Harcourt Brace, 1959. A Friend is Someone Who Likes You. Harcourt Brace, 1958. In a Pumpkin Shell. Harcourt Brace, 1960. The Jewels of the Spirit. Andrews McMeel, 1998. Love is a Special Way of Feeling. Harcourt Brace, 1960. *My Sister, My Friend. Andrews McMeel, 2004. *You Are Loved. Andrews McMeel, 2003.